This is where I'll be keeping all of my fanfiction. All of my fics are Ranma 1/2 related, but I will be making some non-Ranma fics in the future. I watch a crap load of anime so I'm not short on ideas. 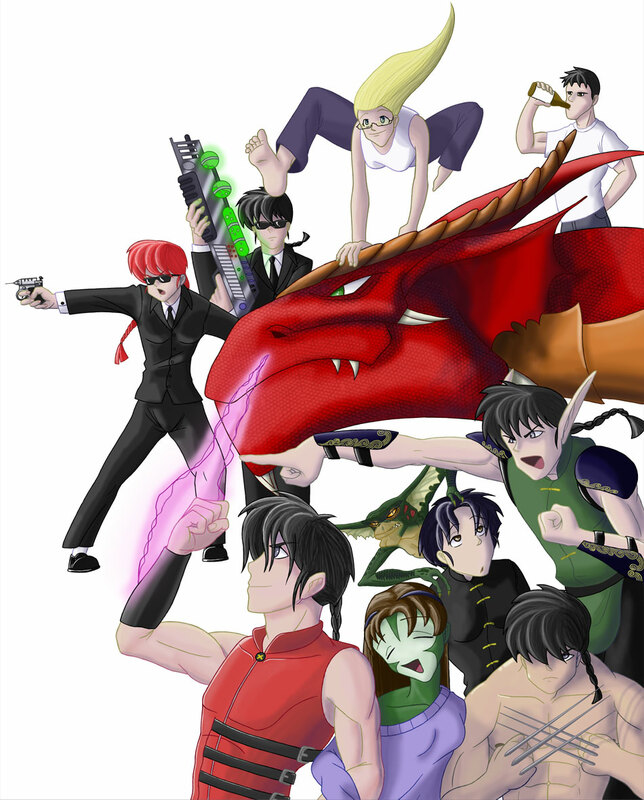 Adamantium Rage/Astral Minds/Saotome Blade/Ranma In Black/Dragons Bond/multi X-Over: The multiverse is in trouble due to a mass revolt by both the angels and the demons and god can't risk fixing it on his own. It's time for a few Saotomes to be unhinged from their dimensions for the greater good. Ranma/Slayer/D&D: Shampoo casts a powerful magical spell in hopes of finally capturing Ranmas heart. It fails because of Mousse and ends up transporting Ranma to another world. An alternate dimension... but wait what's this? Why does Ranma have pointy ears? Ranma/Multi-X-Over: After Ranma disappears Akane, Ukyo, and Shampoo use the same spell on themselves in hopes of finding him, unfortunately the spell seems to choose destinations at random. Even more unfortunate, Happosai tags along. Ranma/Ultimate X-Men: What if Ranma were one of the most powerful psychic mutants on the planet? What happens when he starts his own school for gifted youngsters? What if Genma was extremely anti mutant? Ranma/Wolverine/Street Fighter: After throwing Ranma into the pit of cats and not getting any results decides that bigger cats would make his son learn faster. When Ranma nearly gets mauled to death he brings him to the hospital where after a short while the boy is pronounced dead. However Ranma isn't dead, he's been taken by Weapon X.
Ranma/Men In Black/Tenchi: Ranma is suddenly attacked by a strange monster, after defeating the creature he receives an offer from a strange man wearing a black business suit. What's this? If he joins the MIB he can be cured of his curse? Sold. Ranma/Self Insertion: Josh VanHalteren gets hit by a truck, after spending some time in heaven he decides he'd like to be reincarnated with all his old memories intact in the Ranma universe(how cool would it be to be Ranma?). Oops, god has a sense of humour. Damn, now Josh is stuck in the body of his least favourite character... Akane. How will his knowledge of future events effect the timeline? Ranma/Self Insertion/Marvel Comics/Multi-X-Over: Josh VanHalteren and Evan McNeely, two high school fanfic writers who've got nothing to do at school during breaks but surf the net. Josh comes across a supposed magical spell which he and Evan read out loud. Unfortunately, the spell is real, and it transports both boys to the Ranma 1/2 universe, not only that, but right on top of Jusenkyo. Will they be able to find their way back?